Our character awards for November were given out on Friday, November 10 during a house assembly with our students and staff. 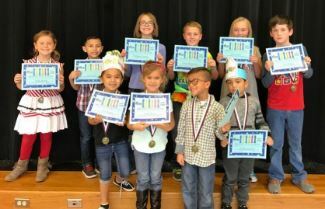 The character trait was Respect and the students were Mia Gomez and Nicholas Esquivel for Kindergarten, Felix Rivera and Sadie Reyes for 1st grade, Israel Larez and Sadie McAda for 2nd grade, Maddison Tennent and Kasen Moneypenney for 3rd grade, and Jadyn Jordan and Carson King for 4th grade. Congratulations to our students who represent Respect!